5 Are bad models to blame? When I worked at the Labor Party think tank, trying to talk about these issues [oppression of Muslim women], people always accused me of failing to back up my arguments with data. But hard numbers were completely unavailable. When I tried to find out about honor killings, for instance-how many girls were killed every year in Holland by their fathers and brothers because of their precious family honor-civil servants at the Ministry of Justice would tell me, "We don't register murders based on that category of motivation. It would stigmatize one group in society." The Dutch government registered the number of drug-related killings and traffic accidents every year, but not the number of honor killings, because no Dutch official wanted to recognize that this kind of murder happened on a regular basis. Last week, a formatting error led to us inadvertently suggesting that there was a one in 1,019 chance of the world ending before this edition. That should have read, er, one in 1019 – rather less likely. Sorry. Feel free to remove the crash helmet. general, but they believe that the game itself does have health benefits. "We're off by a factor of a lot." --Tony Miller, founder of Carol.com a company that hoped to sell about 200 healthcare policies a month but after eight months sold but a total of 160. If you do not have so many players, what can you do? There are 95 registered Brazilian players in the Championship League, 94 French players and 45 English players. When you have twice as few players as other countries it is difficult. Michael Ballack's heart must have skipped a beat for a microsecond. Explain why each of these RSS Forsooths are Forsooths. The most recent issue of Plus includes the article uncertainty: How long will you live? by Mike Pearson and David Spiegelhalter. As in previous modules this module includes elegent animations provided by Mike Pearson. The data for this module consists of UK interim life tables 1982-2006. In the first animation we see the age and the % Hazard = Chance of death before next birthday and the age of the individual lives evolve through time. We think you will enjoy this and other of their modules. Are bad models to blame? How Wall Street Lied to Its Computers, Saul Hansell, New York Times Technology Blog, September 18, 2008. There is a lot of speculation on why major Wall Street firms are reeling from piles of bad debt. These firms hire some of the best and brightest financial experts. These experts are supposed to manage risk to avoid this sort of problem. There is some speculation that this is just bad luck. the level of financial distress is “the equivalent of the 100-year flood,” in the words of Leslie Rahl, the president of Capital Market Risk Advisors, a consulting firm. But that's only part of the story. Some of the blame comes from bad models. "There was a willful designing of the systems to measure the risks in a certain way that would not necessarily pick up all the right risks," said Gregg Berman, the co-head of the risk-management group at RiskMetrics, a software company spun out of JPMorgan. Why would anyone deliberately use a bad model? Lying to your risk-management computer is like lying to your doctor. You just aren’t going to get the help you really need. This may be a case of the fox being in charge of the hen house. Higher risk investments are attractive during good times because they offer greater levels of return than low risk investments. They have to offer greater returns, because they wouldn't be able to attract investors otherwise. But these greater returns will disappear if you have to hold back a large financial reserve to cover the downside risk. So there is a great temptation to pretend that high risk investments are really not high risk. How were these models flawed? One thought is that they used the wrong time horizon. One way they did this, Mr. Berman said, was to make sure the computer models looked at several years of trading history instead of just the last few months. The most important models calculate a measure known as Value at Risk — the amount of money you might lose in the worst plausible situation. They try to figure out what that worst case is by looking at how volatile markets have been in the past. But since the markets were placid for several years (as mortgage bankers busily lent money to anyone with a pulse), the computers were slow to say that risk had increased as defaults started to rise. It was like a weather forecaster in Houston last weekend talking about the onset of Hurricane Ike by giving the average wind speed for the previous month. Another problem is that many new investments are far more complex than in the past. "New products, by definition, carry more risk,” [Ms. Rahl] said. The models should penalize investments that are complex, hard to understand and infrequently traded, she said. They didn’t. 1. This is just one of many examples of someone being pressured to produce results that skew the numbers in favor of a pre-ordained conclusion. What other examples are there? 2. What protections need to be put into place to encourage the use of more accurate models? Re Denver, a Rare Display of the Go-for-It Mentality, Sept. 16: Judy Battista's analysis of Mike Shanahan's decision to go for a late 2-point conversion in Denver's game against San Diego is statistically unsound. The relevant outcome is winning the game, not a successful conversion. If the probability of a point after succeeding is 0.99 and the probability of a 2-point conversion succeeding (for the Broncos) is 0.536, the probability of winning in extra time is 0.5 and the probability of another score in regular time is small, then the probability of winning with a 2-point attempt is 0.536. and the probability of winning with a P.A.T (Point After Touchdown). is 0.99 times 0.5, or 0.495. So the odds favor the 2-point attempt, not the P.A.T. Home-field advantage and other factors may change these probabilities, but the fact remains that the 2-point try is hardly a reckless gamble in this situation. (1) What do you think of Little's analysis? (2) Do you think that any of the probabilities Little mentions are known to three decimal points? The recent wild swings of the stock market suggest a chance to get rich. This reminds me of one of my favorite Chance News articles that appeared in Chance News 5.08. Your July 14 Week in Review article on lottery advertising repeats stereotypes about lottery players' being poor and uneducated and swept up into a gambling addiction. No doubt many are. But Gov. George E. Pataki's statement that "it has always bothered me to hold up the prospect of instant riches" could also be recast as, "I want to take away the only prospect poor people have of getting out of their rut." Before lotteries, other options existed for people to improve their lives, and the barriers were not so high. Graduate education today is expensive; many professions require training as well as licensing, and investing in stocks requires substantial equity. Most people are not so brilliant that they can start an Apple computer company in their garages. So, playing the lottery becomes a good investment when no alternative is better. Lottery players know that the odds are stacked against them, but they don't have to spend a lot of money. Quite a few win regularly. Many who play Lotto or Take 5 use wheeling systems, which, contrary to statements by lottery officials, do increase the chances of winning. I know; I play Lotto and I've won everything except the jackpot, and I win several times a year. Yes, I have lost more than I've won. But in the tedious world I inhabit along with so many other New Yorkers, I've bought a fantasy. If I ever win the jackpot, I'll wave to you from Sutton Place. A recent methodical study of Wikipedia's one hundred articles about the 100 U.S. Senators reveals that, on average, any one of these articles is in a state of mild vandalism to egregious defamation for about 1.63 hours per day. The study took data from the 4th quarter, 2007. In all, the median duration of a damaged edit was 6 minutes, but the mean duration was 1,440 minutes (exactly 24 hours). These 100 articles were viewed approximately 12.8 million times in the fourth quarter of 2007. Over 378,000 of those views could be considered "damaged", yielding a 2.96% rate of damaged views. There were about 13.2 million article-minutes during the quarter, and over 901,000 of those article-minutes were in a damaged state -- 6.80%. Note that the study elected not to include certain types of common vandalism, such as "page blanking". The study also limited the bounds of vandals' entries to the duration of the calendar quarter, even if the vandalism pre-dated the October 1 entry point, or persisted beyond the December 31 exit point. So, conceivably, the "problem" of such vandalism is actually worse than reported in the summary above. 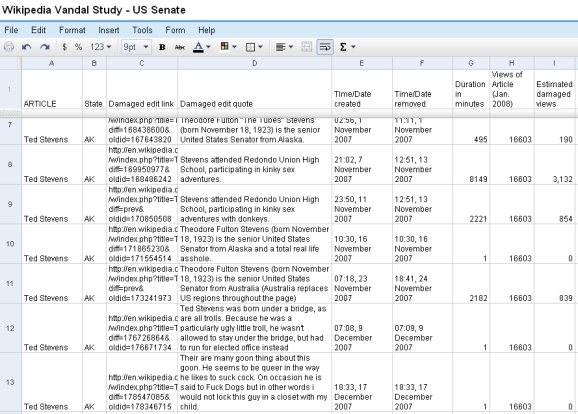 The entire quarter's worth of data is available within a Google spreadsheet, where the study's organizer makes his private contact information available and welcomes discussion. (1) Were most of the vandalized edits made by anonymous IP addresses or by "registered" users of Wikipedia? Why does Wikipedia allow anonymous IP addresses to modify articles about named living persons? (2) Which of the 626 reported edits was most damaging to the subject of the article? Is it worse to have something highly libelous persist for a few minutes and a handful of readers, or something mildly hurtful persist for a few weeks and hundreds of readers? (3) What constitutes an "attractive nuisance"? What online entities were intended to be protected by Section 230 of the Communications Decency Act? Is Wikipedia merely an "interactive computer service" and therefore entitled to immunity from process that might otherwise be leveled at a print publisher? (4) Was this survey's methodology flawed in substantial ways? How so? Do you think Sarah Palin is qualified to serve as Vice President of the United States?" No matter how often it is pointed out that voluntary surveys are more or less worthless, PBS, in hopes of increasing revenue via publicity, is pandering to the statistically illiterate in order to generate numbers which are entirely meaningless. This behavior is totally shameless. PBS tacitly admits here that this voluntary poll is stupid and will be manipulated by the fierce partisans, but presses on with the farce, nevertheless. Readers of Chance News, the ones in the trenches who teach statistics, might wish to go here to add to the many critical comments about the poll. A friend of mine who teaches business strategy at Temple accuses statisticians of reveling in moral superiority because they refuse to participate in this enterprise and thus, let the statistically illiterate triumph. (1) Would a poll of this strategy of non-participation restricted to statisticians be meaningful? (2) Would a poll of this strategy of non-participation open to everyone be meaningful? This page was last edited on 12 October 2008, at 22:40.